I keep finding more and more picks for spring. I am ready for warmer weather - and wearing spring clothes! This fun dotted blouse comes in black with white and white with black dots. If you like pinstripes - you will like this wrap dress with ruffles. This is strapless blazer top is very trendy and only $20. This comfy rounded v-neck tee is one of my favorite brands. This classic black cold shoulder blouse is 40% off. I think a lot of people will like this pinstriped lace top that is only $20. This long sleeve twist hem tee is on sale for $15. This “sunny” sweatshirt looks so comfy and is only $39. This cute red ruffle blouse is only $25. This lace blouse is pretty. I like this striped sweater that is only $18. These cute espadrille sneakers are over 50% off! Just in case you missed it - I shared 15 more spring items HERE. I always enjoy checking out your finds! Yes! I'm ready for spring, too! 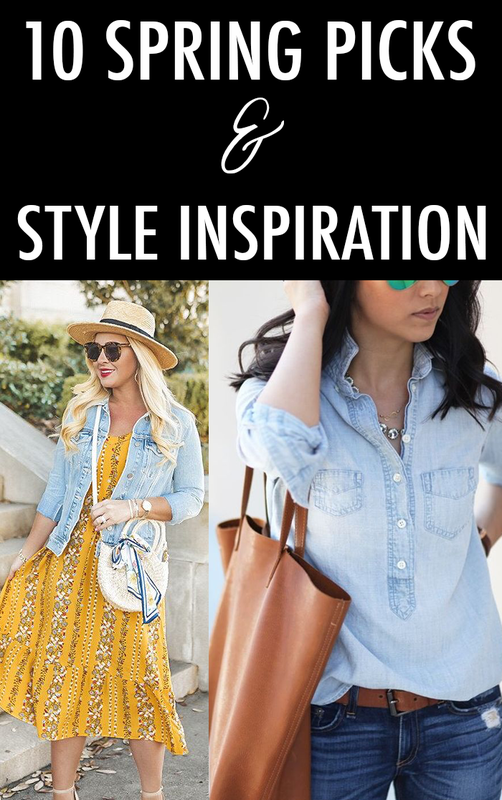 Love that dress outfit in your inspiration picture!